You know those awesomely long and totally overwhelming posts that have one million recipe links? This is not going to be one of them. This is just a love letter to lentils. With a few links. My sisters were here this week (hey, how about I tell you the same thing 100 times and you pretend I didn’t? sheesh.) and I uncovered a shocking secret about my younger sister: SHE HAS NEVER TRIED LENTILS. Or had never, until this week when she stayed with me and obviously, I fed her her very first lentils like any big sister would. After her first bite, she said, “Yummmm. They taste kind of like beans.” What?!?!?!? What are lentils? Basically, beans. Small, cute little protein-packed beans. Where do I buy lentils? At the grocery store, usually in the canned or dried goods section. I’m guessing it will be by the other dried beans. Here in the Philippines, I can buy them canned, but I’ve never seen that in the states. How much do they cost? At home, I could buy them for less than a dollar per pound. Are they really that healthy? Fiber, protein, folate, iron… gang’s all there. For real! How do I make them? Basically, you have to boil them until they’re soft. No presoaking or any other annoying steps required. Will I like eating them? Yes. Red Curry Lentils: amazing (like, honestly the best ever) flavors from the coconut milk, curry paste, and garam masala, plus a pretty red color. For surely the best lentil starter recipe for all you newbies. I’ve actually gone so far as to name this my personal #1 favorite Pinch of Yum recipe. Wait, do I have to choose just one? There are a lot that I love and most of them involve more stuff like sugar and butter and chocolate. But I reeeeeally love this one. Easy Red Lentil Dhal: made in about 20 minutes, made in about 20 minutes, made in about… saucy and mildly spicy, perfect over rice, and made in about 20 minutes. All over it. Creamy Thai Sweet Potatoes and Lentils: coconut milk FOR LIFE, can be stew-thick or soup-thin, with tomatoes and sweet potatoes and cabbage to round out the health-ometer. Kabocha Squash Lentil Curry: extra healthy because of the squash and tomatoes, super creamy and smooth consistency, fills you up forrrrever, and hey! you can use any kind of squash. Coconut Green Curry Lentils: very green – including spinach – yay, a light and bright flavor from the green curry paste, making it all cozy and saucy and perfect for pajama dinners. Thai Basil Coconut Lentils: super unique, bright, fresh lemongrass and ginger flavors from the tom kha paste, plus extra veggies for lots of color and texture variety, loads of fresh basil. Apparently lentil recipes are affected by that same shopping principle that makes you gravitate towards buying different varieties of what is really the same item, every.single.time. Does that happen to the rest of the world? I definitely have at least 50 varieties of the exact same cheapo flip flops in my little shoe cabinet. Want to know what I brought way too much of to the Philippines? FLIP FLOPS. Good grief. At least the good thing is that I wear one pair of them. In the end, my sister gave red curry lentils two thumbs up even though we made it with broccoli and it sort of turned brown. You can’t lose here, friends. Lentils for life! I have been looking for a lentil recipe and these seem perfect. 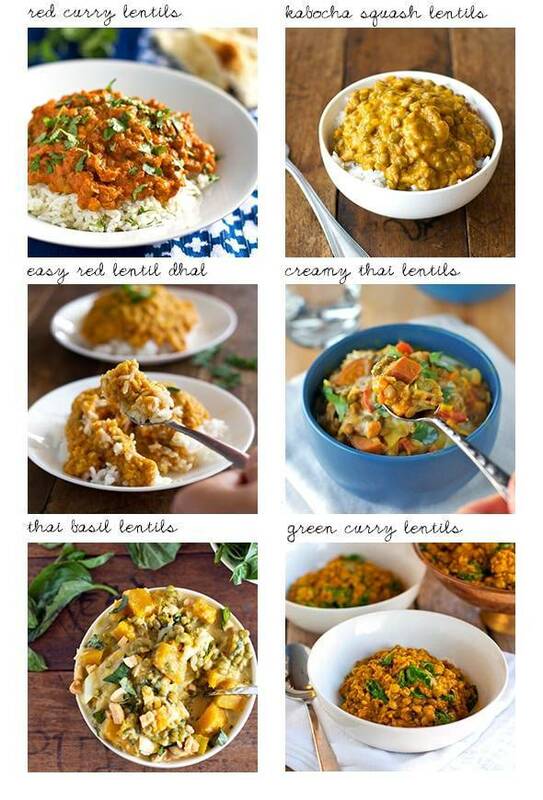 I think I will try the Red Curry Lentils soon. pinning them all – I could eat my weight in lentils. I love them! Red curry lentils is probably my #1 favorite Pinch of Yum recipe, too. Love that one! Can’t wait to try some of these others. Ah! Yes. It’s a good one. I don’t even know what inspired me to make it way back when, but it’s inspired many variations since then! Funny! Glad you liked those thai basil ones.. they’re one of my faves especially when I’m craving something out of the box. And yes, I’m feeling better, and yes we had a great time together. 🙂 Thanks for the nice comment Sally! We had your green curry lentils just a couple days ago. Good stuff. I have a girlfriend who’s obsessed with Trader Joe’s pre-cooked lentils. They come in a one-pound container in the produce section. She uses them for everything. Most recently I had a salad of hers that was basically the lentils with Greek salad ingredients and fresh herbs with a balsamic vinaigrette. Beyond delicious. Ahh! That sounds perfect! I need to become a Trader Joe’s grocery shopped when we come home. Okay, I’m convinced. I’ll try the lentils!! I am not the biggest lentil fan in the world but those are some good looking recipes! I agree with the love for lentils. I’ve got 3 kinds in my cupboards currently. I’ve been known to eat them by the spoonful right out of the pot while still on the stove. I actually made your squash curry the other night, the boys of the house claim to HATE squash, and were none the wiser that their beloved curry was hiding a boatload of healthy squash, mwahahaha! My goal is to make all these recipes. Yummy! YES! I love lentils! LOL…I took lentil soup with me to work one day (I’m a nurse), and some of my coworkers were like”WHAT is THAT??!?”. “Why, they’re lentils…:)”. Actually, you can buy canned lentils here in the states too, but they are already seasoned as a soup. Progresso makes ’em. SO yummy. Thanks for this post! Sweet! I’ve actually had a canned lentil soup back home, I think it’s Amy’s Organic brand, but here you can just buy them straight up like you would any other beans! I love it! So sweet of you to bring the little sister into the wonderful land of lentil! I love lentils and love that you love lentils…and will be trying each and every one of your lentil recipes! Great lentil roundup! Love the primer and the recipes! I made a a tabbouleh with lentils once. I am inspired! I’m in the lentil-love club, too! I have a kid who needs a lot of fiber and so I’m always trying to squeeze beans in to recipes (bad mental image? sorry). Imagine my delight when he loved green lentil soup at an Ethiopian place we like! Thanks for the great recipes and for showing the lentils some love! Wow – that’s awesome that he loves green lentil soup! I’m impressed! Like your sister, I’ve not eaten lentils but if they taste like beans and they are good for you then I’m all for them. Thanks for the links to all your great recipes. Really happy to see this post about lentils. I absolutely LOVE them! I thought I was the only one. I MUST try these recipes! All of these look incredible! I just made lentils in my crockpot and I’m excited to make some more! I love it. Lentils are great. Thanks for the post. Pinned ya. I love cooking with lentils but always run out of recipes! Glad you posted all these great ones! I’ve always liked lentils (I’m a semi-vegetarian) but never had a really exciting recipe…until I saw yours. My mouth is watering just looking at the pictures! Can’t wait to try some of these recipes. This is fabulous-I want to cook lentils-I like lentils-I have been afraid of lentils…had a bad bead experience and after hours of simmering ended up with something no one would eat, nor would I serve…tonight it is red curry lentil time for me and mine!